Today’s featured substrate is rayon challis. Rayon Challis is very lightweight plant based fabric that has a smooth, luxurious hand and slinky drape. The term Challis refers to the soft characteristic of the material, and it’s barely brushed surface texture. Some rayons have a bit of a sheen to them, but the plain weave of Cotton+Steel’s rayon challis is matte, with richly saturated colors. The wood pulp base of this semi-synthetic fabrics gives the fabric great breathability. While the best thing about Rayon challis is it’s light and silky drape, it may cause some difficulty when sewing. Cotton+Steel rayon has a firmer hand and thickness than other rayons, making it easier to work with and less clingy when wearing. 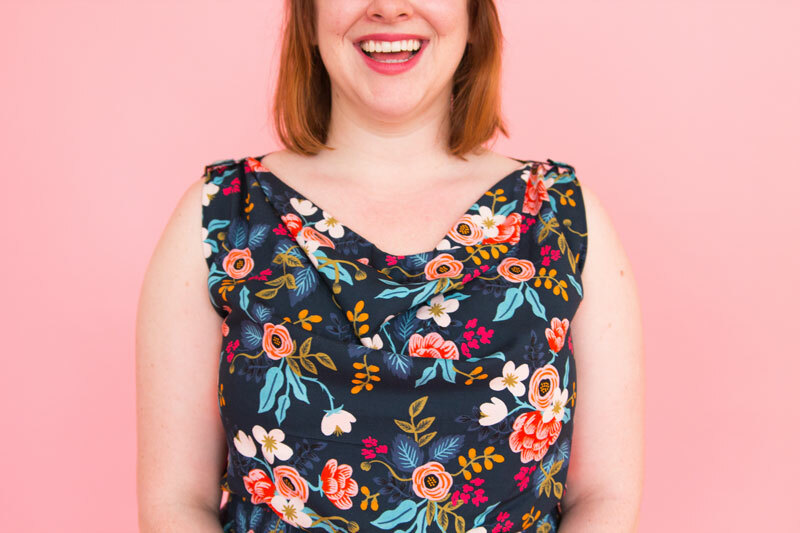 If you’ve been intimidated by working with rayon in the past, Cotton+Steel rayon is a great one to start with! 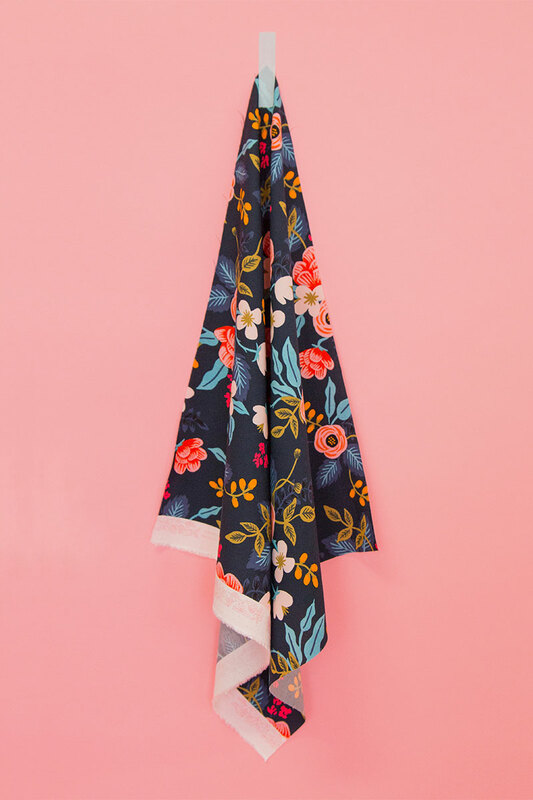 Haley’s Myrtle is sewn up in a rayon from the Les Fleurs Collection by Rifle Paper Co for Cotton + Steel, Birch Floral in Navy. Cotton+Steel recommends that you dry clean their rayons. However, you can use your discretion and test wash a swatch to determine how you will care for your fabric. But, always be aware that results can vary. This is the amount of shrinkage that occurred on a 5″ square of rayon challis after washing warm and drying warm. Over-pressing can cause the fabric to shine. Press with a dry iron at a medium temperature. If you’d like to be extra cautious, use a press cloth. Let the fabric rest and cool down for a couple of seconds before you remove it from your pressing surface. This will help the pressing or shaping stay in place. Be extra mindful of your fabric’s grain line and use a rotary cutter for accuracy. Try cutting rayon challis with a layer of tissue paper underneath the fabric. The tissue paper will prevent the fabric from shifting as you cut your pattern pieces. Tailor Tacks, Tracing Wheel, and chalk marker all work well. Light colored rayon challis may be transparent. If your fabric is a slightly see-through, use lighter colors of chalk or tracing paper. Fusible sheerweight interfacing works perfectly and will not effect the drape of the rayon. The more old-school sewist would recommend using silk organza. Your thread weight should always match the weight of your fabric. For rayon challis, 40wt polyester or cotton work best. 70/10 HJ or HM, new needles always! Needles will snag your fabric if dull. A serged or zig-zag finish is the best way to tackle this sometimes tricky fabric. For a more professional finish, try a Hong Kong finish with some rayon seam binding. Bulky hems will weigh down your hem and might prevent the hem from flowing with the rest of your garment. A single-fold ⅝” blind hem will keep your garment’s hem light and airy. The Myrtle is a perfect dress for Rayon Challis. For cowl necklines, bulky fabric can create a bit of bulge right above the bust. Rayon challis will lightly fold itself and create the perfect drape of a cowl. 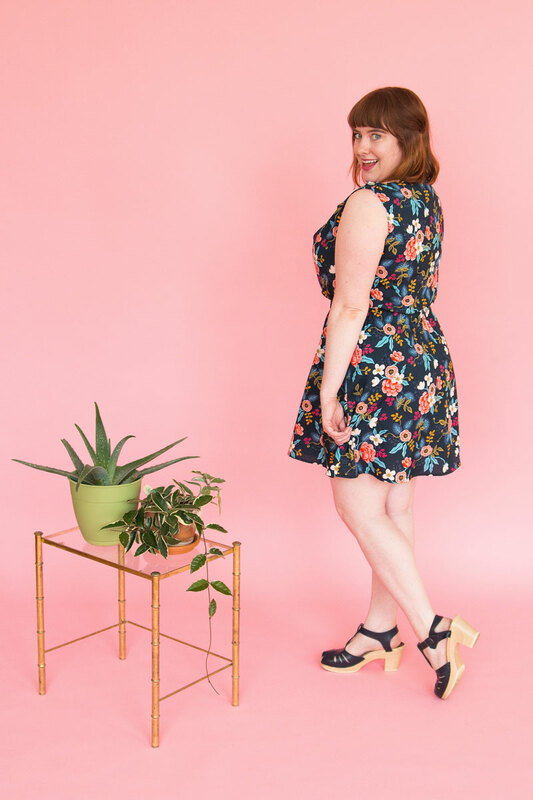 The Myrtle has an easy elastic waist that lends it’s self to an airy, light fabric like a rayon challis. This substrate gives the skirt the freedom to sway and flatters anyone’s figure. A rayon Myrtle is a perfect blend of casual and classy and has the potential to be a tried-and-true dress in your wardrobe. Seriously, you could live in rayon challis Myrtles all summer long. In a rayon, the Laurel will retain its shape while also adding a flirtatious swing to the dress. It is semi-fitted and really lets your Cotton+Steel prints shine without being bogged down by distracting details or shaping. 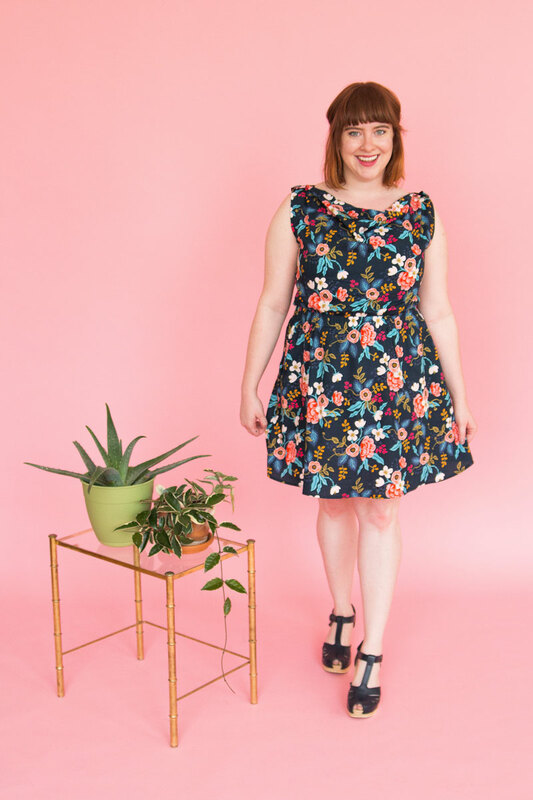 This Laurel is sewn up in a rayon from the Frock Collection by Sarah Watts for Cotton + Steel, in Gemstone Navy. Rayon challis can be taken even one more step in a drapey direction by cutting it on the bias! One of our classics, Oolong, is cut on the bias and has a lovely ruched bust. 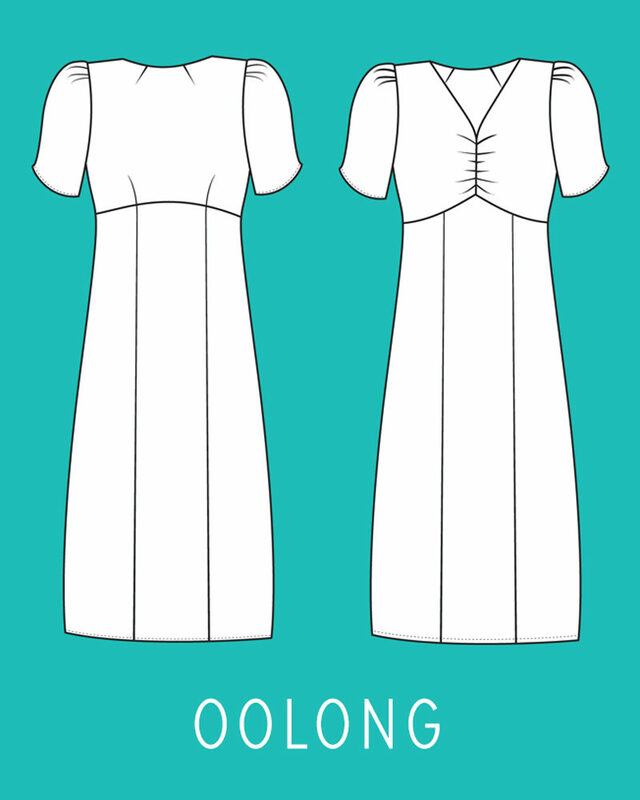 If you’re worried about your rayon being transparent, the Oolong is lined and the bias allows for no zipper. Hallelujah! Staystitch immediately after cutting your pattern pieces. Even if the cut line just a bit curved, staystitch. This will help keep your seams from stretching and not matching up when sewing. Despite your best efforts at accurate cutting, seam lengths may differ when pinning. Sew with the longer seam on the bottom of the shorter seam, letting the feed dogs ease the longer side to match the shorter one. Use sharp, fine pins and pin horizontally to keep the fabric from shifting. Test your tensions before sewing up your garment. Delaney likes to hold her fabric from the front of the pressure foot and behind it, with a bit out tautness. This may help if your fabric seems to be puckering at your stitching line. Avoid hanging your pattern pieces between sewing sessions, rayon challis will most definitely stretch with gravity. Instead, store your pattern pieces flat or rolled up. Stay tuned as we dive into some more Cotton+Steel substrates later this week! Definitely not a beginner’s fabric. It looks so innocent too. Takes a press well, and an unpress too, using a little water spritz. Cheaper cuts are often off grain, so it’s worth it to buy quality stuff. I love rayon challis’ drape and coolness to the touch. I didn’t want that dress/fabric until I saw this! All the heart eyes! For garment care, what do you recommend with rayon? I prewash on cold and let it air dry before construction. Afterwards, I’ve been washing on cold and then hanging to dry, but I feel like over time the fabric looks dull and a bit faded? It doesn’t even take many washes. Granted the rayon is from a different manufacturer, I’m not sure if that’s just how the fabric is or if it’s the collection I have. In my experience, I haven’t had any problems with the colors of Cotton+Steel rayon fading. But, if you want to be extra careful, you can always hand wash, warm with a gentle detergent if your worried about fading and shrinking. Are you drying it outside? Hang the garment inside-out, or on a drying rack inside (or on a good hanger with plastic shoulder-shapers in the bathroom). Sunshine is a disinfectant and I like how clothes smell dried on the line, but fade-prone dyes fade even faster in the sun! Nope, just in the laundry room. Hanging stuff to dry outside would probably be frowned upon in my neighborhood, lol. I am a rayon girl through and through, but it has it’s pitfalls. Your shrinkage test doesn’t tell the whole story. It doesn’t look like much, but you can lose 10-12 inches from three yards in length and an inch in width and if you were cutting it close on your yardage, you will notice it. I always buy an extra 18″. Cold wash with your regular laundry detergent, medium tumble dry. A cold soak and a line dry won’t do it. After that it’s all line dry, and a quick trip in the dryer AFTER it’s dried to soften it up (do a lot less ironing that way). It is impossible to tell which cuts will keep their color and which won’t ahead of time, though all blacks and dark blues will go in time. Your seams will collapse before then anyway, unless you flat finish them. Oh yeah, wider seam allowances are necessary. Nothing lasts forever. Rayon is too beautiful for this world anyway. Love it. Thanks so much for your input SJ! That’s the thing about rayon, it’s unpredictable! Your advice is a great addition to the post. I am LOVING these articles about working with different fabrics – so many little techniques that really make the difference between sad failure and gratifying success. A rayon dress is next on my list. I wasn’t aware it would shrink so glad I read this. I am looking forward to the rest of this series. Also appreciate the clues on type of pattern these special fabrics are most adaptable for. Thanks! Great article. I was wondering if rayon would be good for the York pattern. Absolutley! We concentrated on Colette Patterns for this collaboration, that’s the only reason it wasn’t mentioned. In fact, rayon is one of the recommended fabrics for the York. Great article and feedback on handling rayon. 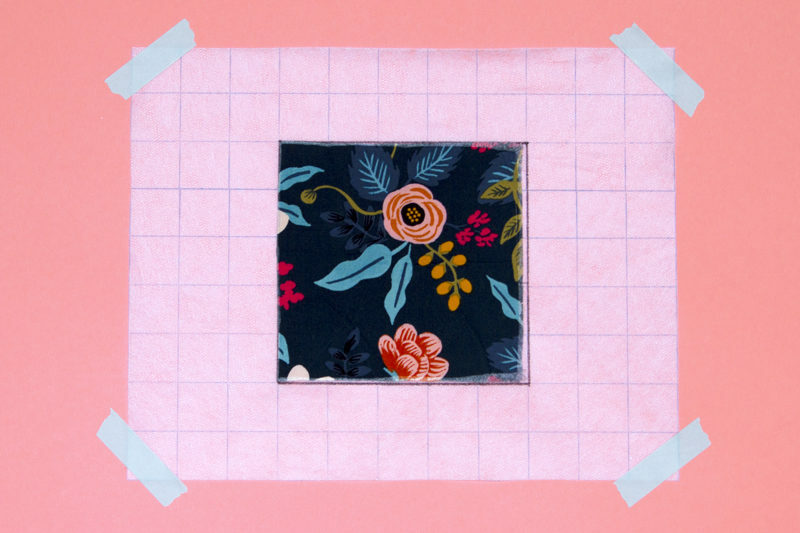 BTW, I love Rifle Paper and happy to see that they translated their beautiful patterns into fabric! Hello! Usually, the fabric bolt or roll will have substrate information.